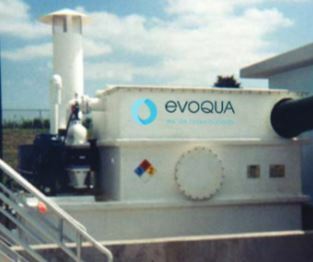 Emergency Chlorine Scrubber – RJ Environmental | JCI Industries Inc.
Evoqua RJ Environmental Emergency Scrubber RJ-2000 is the world’s most popular emergency scrubber system. The process is designed to contain and neutralize chlorine vapors in response to a gas leak or catastrophic cylinder failure. 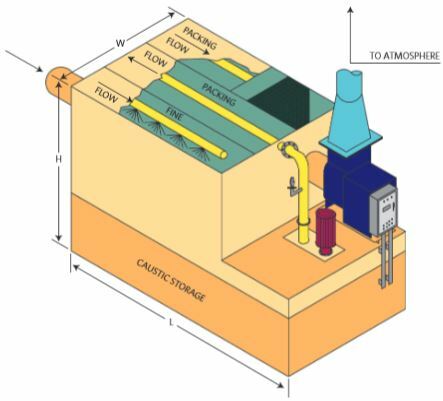 The RJ-2000 scrubber uses a unique horizontal flow path, with a proprietary caustic distribution network, to absorb better than 99.999% of the chlorine gas entering the scrubber, in a very compact footprint and low profile. The RJ-2000 scrubber is the only emergency scrubber to have been tested by an independent, certified laboratory in a full 1-ton chlorine gas release. During this test, a catastrophic accident was simulation with chlorine release rates of 100 lb/min. The scrubber saw inlet chlorine concentrations in excess of 500,000 ppm, and outlet concentrations less than 1 ppm, safely below the 5 ppm Uniform Fire Code limit.